With all my heart, I cannot declare myself to be of one religion to the exclusion of the people of others. With all my heart, I cannot exclude anyone from the wholeness of that absolute reality called truth, divine, god, or those other many names that state the nondual one without a second. All peoples, philosophies, religions, and psychologies, while each unique, are embraced as emerging from the same, one Absolute Reality or Brahman, called by many other names. The personal views of Swami Jnaneshvara are eclectic, nonsectarian, and omnidenominational. He was never initiated into, nor has joined any particular religion (during childhood the decisions about religion were left by parents for his own later choice), and his renunciation as a swami is one of setting aside exclusive identity so as to embrace the whole. While embracing all, his personal leanings are towards the self-awareness and Self-Realization teachings and practices of the Upanishads and the Yoga Sutras, as well as the internal meditation practices of Samaya Tantra and Sri Vidya, all of which are outpourings of Sanatana Dharma, the never beginning nor ending way. Following the tradition of Swami Rama, no rituals are performed or promoted, and the practices of contemplation and meditation are internal, and non-sectarian. Are you part of institutions founded by Swami Rama? What institution is the real heir to the tradition? After Swami Rama left the body in 1996, there were intense institutional politics and cleansing processes whereby many students of Swami Rama were no longer welcome at certain locations. This was mostly triggered by conflicts between two men who have falsely claimed to be the sole and authorized successor of Swami Rama, while Swami Rama himself named no successor. In light of this politics and pressure, Swami Jnaneshvara finally accepted these realities, and moved out of Swami Rama's Rishikesh ashram in 2001, returning to the US. Thereafter he was no longer affiliated with any such organization, institution, or ashram, serving instead as an independent emissary of Swami Rama and the Himalayan Tradition. In 2007 the trustees of Swami Rama's Rishikesh ashram (sadhanamandir.org) have started to reorganize the ashram programs regardless of the still present influences that brought the reduction of the teachings of Swami Rama during recent years. 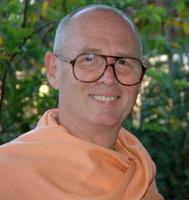 Swami Jnaneshvara has accepted the 2007 invitation of the trustees to be on faculty of the new programs, and has once again started teaching at the ashram, as well as at the nearby Himalayan Institute Hospital Trust (hihtindia.org). Hopefully these actions by the majority of the trustees will set the stage for creating harmony between people. There are now biannual three-week Meditation Intensive programs in the ashram (March and November). Most people like to refer to Swami Jnaneshvara simply as "Swami J" or "Swamiji" as is the traditional greeting for all swamis.